Home / More / Library / List of Medicinal Plants / Desmodium spp. COMMON NAMES: Pua pilipili [Hawai’i]; shi lin tong (D. styracifolium), hu lu cha (D. triquetrum), jin qian cao (D. styracifolium) [China], long she huang (D. triquetrum, D. pseudotriquetrum) [China, Taiwan], nian ren hua [Taiwan (D. sinnatum)]; serious pain in the #%@$$%# hitchhiker! [USA]; amor do campo [Portugese (D. adscendens)]; amor seco [Amazonia]; amorosoes [Peru (D. adscendens)]; bosuku [Congo (D. adscendens)]; burbur [Creole (D. adscendens)]; carraficho beiço de boi [Brazil (D. adscendens)]; chuchu maiharina [Quechua (D. adscendens)]; cousin trois sous [France (D. adscendens)]; dusenesh [Peru (D. adscendens)]; hamsapädï (“swan feet”) [India (D. triflorum)]; loaka [Congo (D. adscendens)]; lokanga [Congo (D. adscendens)]; manayupa [Guatemala (D. mollicum)]; margarita [Peru (D. adscendens)]; pash pam [Belize (D. adscendens)]; pega-pega [Brazil (D. adscendens)]; prishnaparni [India (D. gingaticum)]; salaparni (D. giganteum) [India, Nepal]; salia kuiva [Quechua (D. adscendens)]; strong back, beggar-lice, tick trefoil [English]; trèfle savane [France (D. adscendens)]. PLANT PARTS USED: Leaves and Stems. Infused, decocted. RANGE: Tropics and sub tropics. TOXICITY: None appear to be toxic with the exception of Desmodium oojeinense. Until further research is done, avoid using Desmodium seeds in medicinal preparations. Not be used in pregnancy. D. gyrans is used with Banisteriopsis caapi in Ayahuasca mixtures. 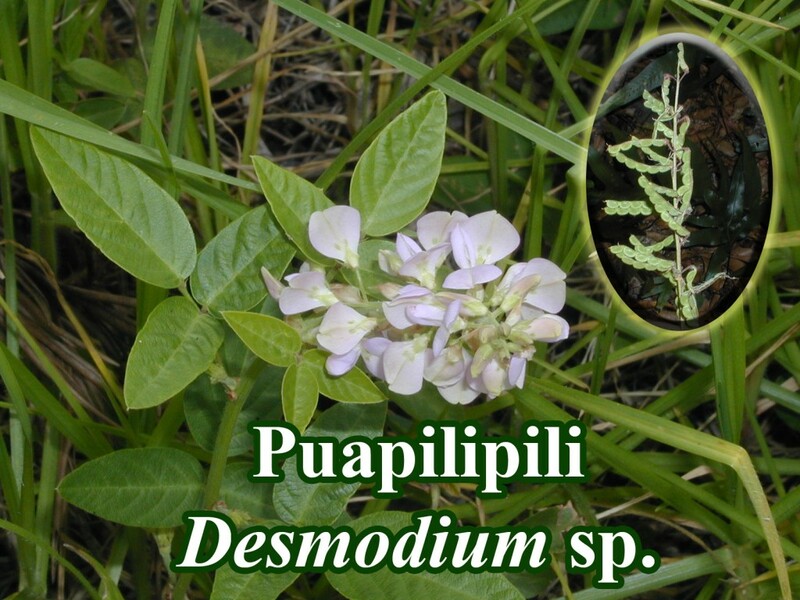 There are 450 listed species of Desmodium with 7 growing in Hawaii. For expediency I have lumped them together here. While there are many overlapping features in the genus, there are also traditional differences in usage. Some species are used more in South America for liver disease, asthma, and back pain, while others are used more in China for kidney stones and gall stones.